I have been in project reduction mode even though I really want to start something new. It struck me that everything in my bag now is plain stockinette or garter stitch as in Tesla and the socks, and the two unfinished projects are both novelty yarns in simple stockinette. 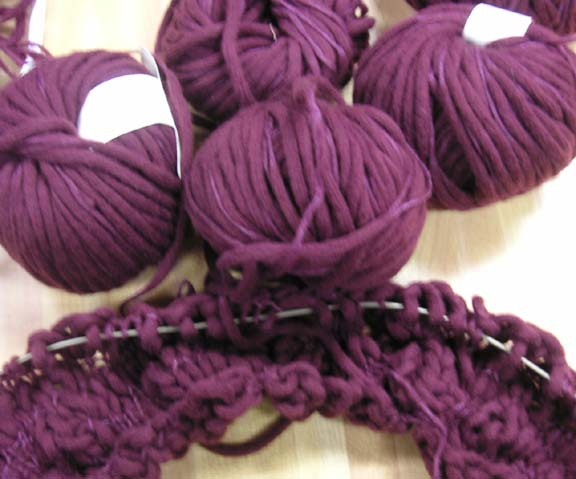 I want to knit something with plain yarn with either color or texture. At the same time life is in such disarray right now that I cannot stand to have more unfinished works floating around. I must finish my UFOs just for my own peace of mind. Imagine my absolute horror yesterday when I found another knitting project in the back of the closet, one I have no memory of ever starting although I obviously did because it is sitting on the needles. Now I have two current projects, three UFOs and one sweater reconfiguration waiting to be done. There is no end in sight. I thought of throwing the new sweater back into the darker recesses of that particular closet but now that I know it is there I can’t do that. How could that happen? This is a truly disturbing thought. I had previously thought that, even at my most overwhelmed, I always knew what I had – I might not know where it was – but I knew it was somewhere. Now this!!!! Stash yarn doesn’t bother me, it exists for its own sake, but once started a project cries for completion even if not into its originally intended form. When I was younger I loved having dozens of unfinished projects lying around. Now I want simplicity. I want only a few things crying for my attention at any given time. I am feeling a bit overwhelmed by these various unfinished things. I want to get them all wrapped up, only then can I start something new, and no matter what I am always thinking of new projects, and not just of the knitting variety. This new(?) sweater is not what I want to knit right now, but it should go fast. I don’t know why I stopped it. Did I not like the way it was turning out??? I will have to pick up where I left off and see. It looks nice, kind of a bulky turtleneck shell. This morning, since the house is cold, that actually sounds nice. On other fronts I am below the instep and working and about midway through the arch of the foot on the sock. I had hoped to be further, had hoped to knit on the train to NYC on Thursday, but the train station had no parking, the nearest spot was BLOCKS away and we would not have made it back to the train in time. I just drove instead. George did drive back after the concert. Socks on size 0 needles are not the best car knitting in the dark but I did manage to make a little progress, very slowly, and did not make a mistake until we got to Fishkill, 3/4 of the way home. It was too dark to fix in the car so a little surgery was necessary once we got home. Since then there has only been about an hour of knitting time as I spent as much daylight as possible in the yard in anticipation of another rainy weekend and the evening ended up being occupied by other tasks, not unusual around here. Fuschia bulky cardigan. Actual knitting on this is almost done, I am on the last sleeve. It got put aside because there are about 14 different yarns in a 20 - 22 row repeat and I needed a project to take on a trip. 14 yarns makes for a lot of confusion in a car or on an airplane. Of course, when I finish knitting I will have all those yarn ends to deal with. Antea Shell (shown above) is a little rumpled as it has been folded up in the top of my closet. It is waiting for me finish the edges. I would pick this up and start knitting right away but my hand was a little stiff this morning knitting the Aiko sweater on 5 mm needles. Kingfisher was on 5.5 mm so I don't know why the 5 mm would bother my sore thumb more, unless it is the difference between bamboo and Addi turbos. It might be, as I find my knitting guage is different on needles of the same size but made out of different materials. I have been frequently told that this should not happen, but it does, and I have frequently changed needles if my guage was just slightly off, and a different needle material often makes the difference. At any rate Antea was knit on 2 or 2.5 so it might have to wait just a little longer. I should empose a moratorium on new knitting pattern books. Of course this will never happen, but at least I realize that I should do this. I have been trying to make sense of the piles of knitting magazines that have come in the past few weeks, and the piles of projects on my floor, and a few other odds and ends, trying to determine what I will knit next (Kingfisher is almost done and would be done if I was not spending so much time dreaming over sweater magazines). And what yarns I will order, if I am going to order yarns. Of course I do realize that I could order nothing and still find plenty to knit, but that does take the fun out of everything doesn't it? 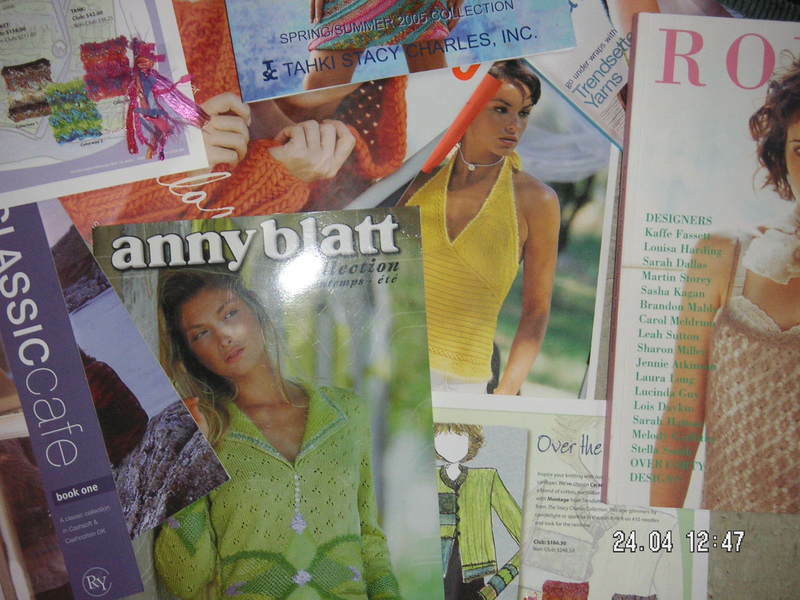 Besides I love the knitting magazines just as much for the new sweaters I will knit as well as for those I will only dream of knitting. Each sweater book is kind of like a wish book I can curl up with and dream about the sweaters, the knitting of them, the wearing of them, the lives I might have if I could knit and wear all those sweaters. Kind of reminds me of being a kid and poring over the Sears and JC Penney catalogs, dreaming of what my life might be when I grew up, if I could wear anything in the catalog and marry the handsome male models and live happily ever after. What is life without fantasy anyway? I am trying to think about any speciality yarns that may not be available if I don't grab them now and, probably for the first time ever, I am actually looking at the list of things that are missing in my closet and trying to incorporate these items into my knitting plans. Originally I thought I would post a list or review of the things I liked in each magazine as they came in and this might help clarify my thinking, but they came too fast and I was busy getting ready for my trip. Now I am all backed up. I also have trouble limiting my choices to the reasonable and manageable. There are probably about 35 sweaters I would like to knit from the spring books that have arrived and this is not really including the Harris Yarns book (which had problems as you wil recall) or the spring Adrienne Vittadini or Phildar books, neither of which I have ordered yet. I will not knit 35 sweaters this year, much less this season. I hope to narrow the list down to things that I hope to finish in this lifetime though. Kingfisher Sweater has about 16 more rows on last sleeve (knit sideways, sleeve head to cuff). 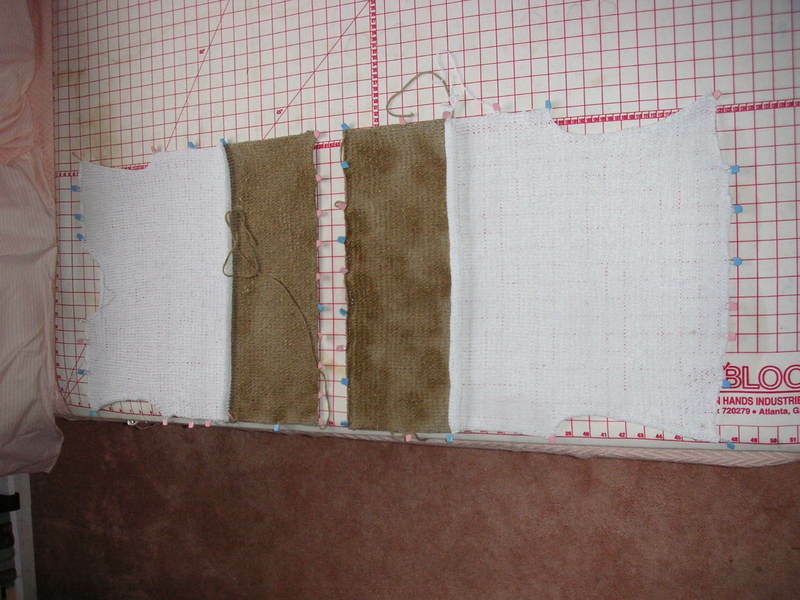 Then blocking and finishing. Pink Cashmere Aiko Sweater remains stalled with only the back completed, but I will pick it up next week. Summer Blendy Sweater set in sand and toast colors was knit two years ago and blocked. Then I decided to rip out and shorten the shell. Since then it has been waiting for ripping (too many yarns, too many ends, what a headache) I will finish this and wear it this season. Olive Mohair cardigan: This was the first sweater I finished. It needs to have a border crocheted around the edges for stability (the pattern did not call for this and I was to ignorant to know better) I have the yarn and I have some matching stretch silk charmeuse with which I will line the sweater. AHA!! This is a sewing project and not a knitting project, it can be moved to another list! Purple cardigan from Anny Blatt summer 2003: Still missing half the yarn. Will look for others to replace and finish as I really like the color and the cardigan. Angora cardigan with ribbon borders: I gathered together the ribbon and glitter yarns for a border on a sweater but don't have the angora yet. I have an idea and color in my mind but haven't found the yarn. Actually I originally had a yarn in mind but could not get enough before it was discontinued, one of those situtations where the yarn store kept telling me it would be in next week for six months. Did I believe them? At first yes. Was I stupid? probably. Will I do it again? not at that store. This might be easier to put off until fall when a wider selection of angora (or fine mohair) will be available. 3 skeins of pink/red Rowan Biggy Print which could be a scarf if I find one more skein. Bag of mixed turquoise, green and blue novelty yarns. These are waiting for me to find a solid cotton to tie them together and make them into a summer cardigan. The yarns are various leftovers, things I was entranced by at shows, and samples sent by mailorder companies that I loved too much to send back even though I had no idea what I would do with them. Did I say I had a problem or what? And I still haven't made any decisions. It is somehow a little bumpier on Matilda than on me, but I am softer so perhaps that counts for the difference. 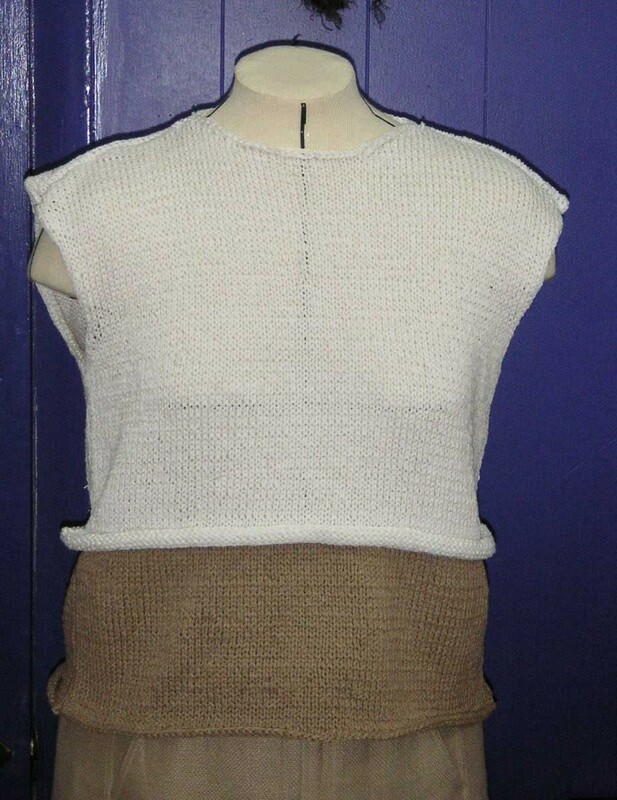 This version of the sweater is lighter and drapier and perhaps will be more wearable than the original, which although sleeveless and cotton, was rather heavy. I have failed in my attempt at monogamous knitting. So much for good intentions. After finishing the back of the Aiko sweater I could not get myself motivated for the front. I love the sweater and love the yarn but am too tempted by other things right now. Besides am I going to be wearing cashmere in the near future? I hope not. I finally ripped out the entire front; all 3 inches of it -- as you can tell I had not gotten far. My heart wasn't really in it. It took me several tries at casting on. Even then, I couldn't keep the pattern straight and it is a simple pattern, I kept dropping stitches in the middle of crosses. No fun. Still I hated the thought of starting something just to abandon it for two weeks after only a couple of rows or inches (if I am lucky). So I tackled the unfinished sweater pile. 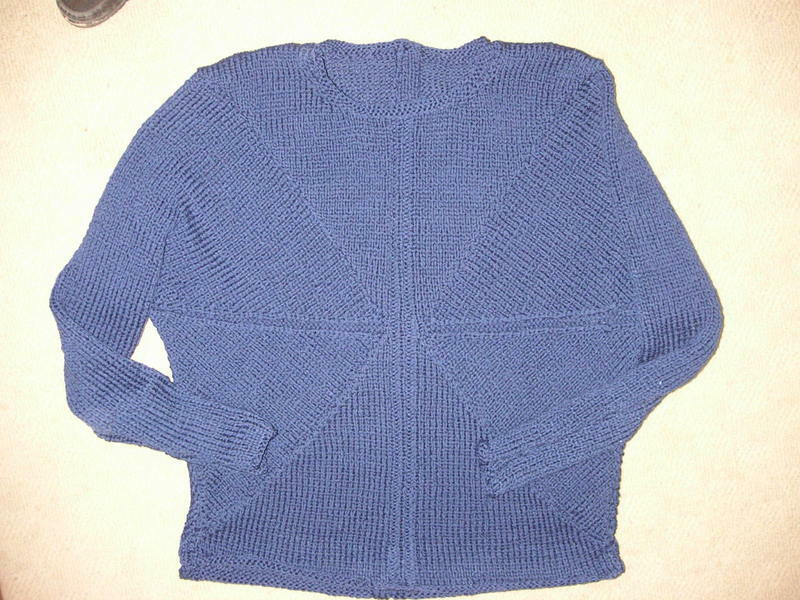 I actually knit this in April 2003 on a trip to Knoxville and Hilton Head. We met Rich who is now my step-son-in-law on that trip. I never meant for the sweater to sit before I knit it up. In fact I wanted to wear it. But I came home from the trip and threw the bag with the completely knitted but unblocked sweater in a box and forgot about it. Then I bought more yarn and threw that on top of the sweater in the box, and well, you know what happened next, it was totally lost. Recently in trying to make some order out of chaos, I unearthed this sweater. It was pretty easy to finish as it was knit all of a piece. 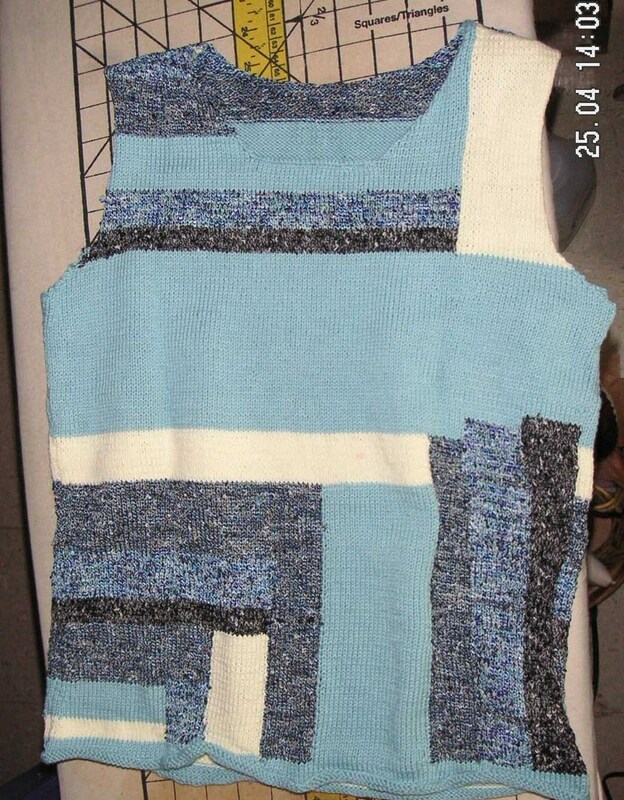 This photo shows the neckline unfinished, as the pattern recommended, but I couldn't accept that. I have knit a little rolled stockingette band. The photo with the neckband did not come out as well as this one though so you will just have to imagine it. This is a duplicate of a top I knit a few years ago. The original was a favorite and this summer I got a big pink stain on the middle of the chest (beets perhaps?). I really couldn't imagine my summer without the sweater so I knit another one last fall, in September actually. 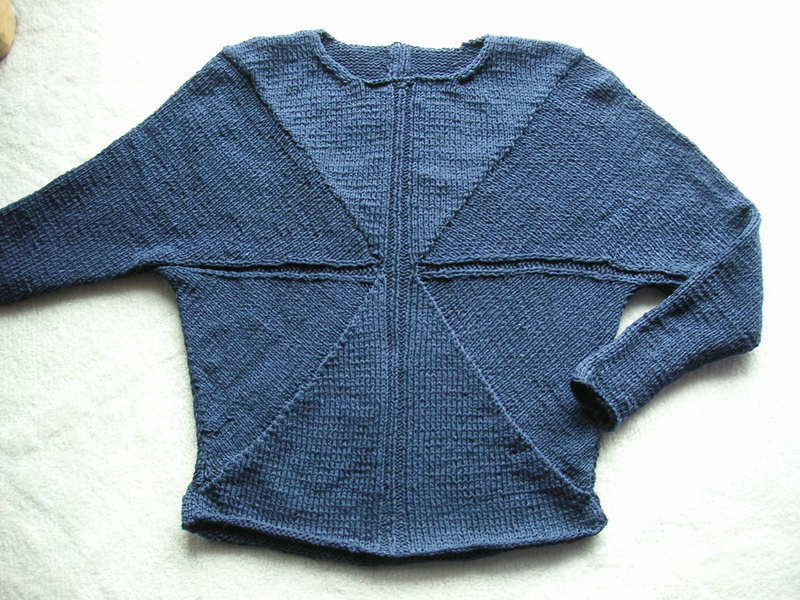 The pattern was from Vogue Knitting, Spring Summer 2000 and was knit in a Adrienne Vittadini yarn, Miranda. The new version was knit in Elena by Filatura di Crossa and I actually think I like this better. The guage is actually the same but the sweater is lighter and scrunchier. I am looking forward to wearing it.